Meet the Team – this page lists our key staff members in order of those with whom a partner or client is most likely to be involved on a regular basis. Debi and Dorothy are usually our partners’ main point of contact. They know most of our partners and their clients very well, having been with the company since 1989 and 1995 respectively. They are responsible for looking after our partners and their clients on a daily basis. They are two of the staff members that partners and their clients would speak to if calling on the client helpline outside of normal working hours. Dorothy is a sister-in-law of our Chairman and Aunt to our Managing and Operations Directors. 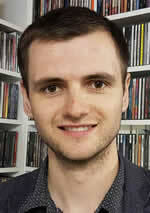 Fraser joined the company in 1999 as a junior Studio Engineer with a passion for music. He has since progressed to Head Programmer and has the main responsibility for ensuring that our partners and their clients receive the right mix of music and media for their businesses. Fraser also shares the client helpline ‘out-of-hours’ cover. Calum is the first member of our team that most of our new partners will hear from. He initially ran a regional office in Birmingham for us, before moving to head office to take a position as our National Sales Manager. His first Board appointment was as Sales Director, in 2014, and he became Managing Director this year. Calum is the grandson of our company’s founder. Henrietta handles invoicing and accounts, answers the phones and generally keeps us all right in the office (she makes a mean coffee!). She originally joined the company back in 1981 before leaving to have a family, and eventually rejoined us in 2008. She is the wife of our Chairman and mother of our Managing and Operations Directors. Michael looks after the systems, from maintaining our old CD systems to troubleshooting our Internet delivery services. Michael originally came to us in 1994 as a computer engineer. This is just as well, as our systems are now based entirely around computers. Finlay and Heather McRae – some of the Directors at GMS Music. Finlay and Heather are the father-daughter team who, along with Heather’s brother, Calum, currently run the business. 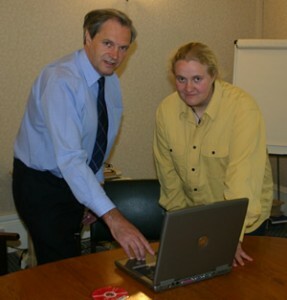 Finlay’s father, Malcolm, started the company in the ‘60s, and Finlay joined in 1976 before taking over from Malcolm on his retirement in the ‘90s. Heather joined the team full-time in 2006, and is responsible for running operations across the company. Finlay retired from his role as MD after forty years in the post, allowing Calum to take the company forwards. He retains the role of Chairman and is still involved in the IT and product development functions.